This is the original 1914 edition published by Lewis Historical Publishing Co. Covers have light wear, inside pages are nice and clean. Small name sticker on inside front cover. 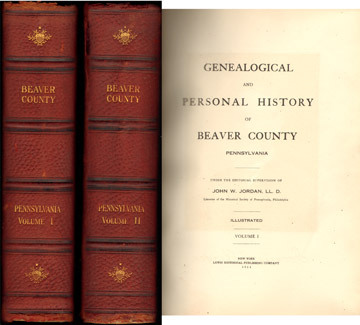 These two volumes are devoted entirely to the family history and genealogy of numerous families in Beaver County, Pennsylvania. Many of these biographies are quite detailed and very lengthy. Many engravings or photographs of individuals are also included. Hardbound, two volume set, 1125 pages plus numerous engravings or photographs on unnumbered pages, with index.